Seven gunfighters are hired by Mexican peasants to liberate their village from oppressive bandits. Stratwitch: What are you doing over here by the wire? Von Luger: What were you doing by the wire? Hilts: Well, like I told Max... I was trying to cut my way through your wire because I want to get out. Q: How many of the real escapees survived? Q: What did Hendley mean when he asked Blythe "What are you doing here?" Q: Are any of the men still alive? The Great Escape is a classic war movie with plenty happening in it. It just so happens that it is my all time favourite having seen it 60 times since it first was released. Steve McQueen , as Hilts, was the driving force behind this movie. He seemed to tie everything together between the American and British prisoners especially in the scene where they were celebrating the 4th of July with the drums and good ole fashioned American moonshine. 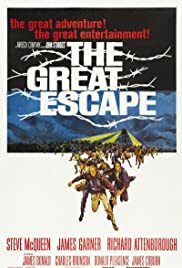 The Great Escape contains one of the most famous movie scenes of all times when McQueen has half of the German army chasing after him while riding his motorcycle trying to jump the barb wire fence to get to Switzerland. 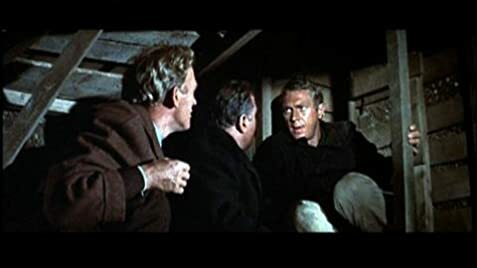 All in all, The Great Escape had a cast of actors that was so strong that it was a wonder they got this movie made in the first place with all of the egos involved. James Garner, Charles Bronson, Angus Lennie, James Coburn, etc.were absolutely awesome. 90 of 131 people found this review helpful. Was this review helpful to you?